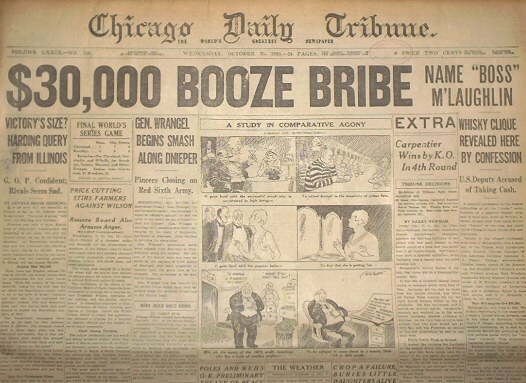 October 13,1920 Bribe involving Boss M' laughlin. 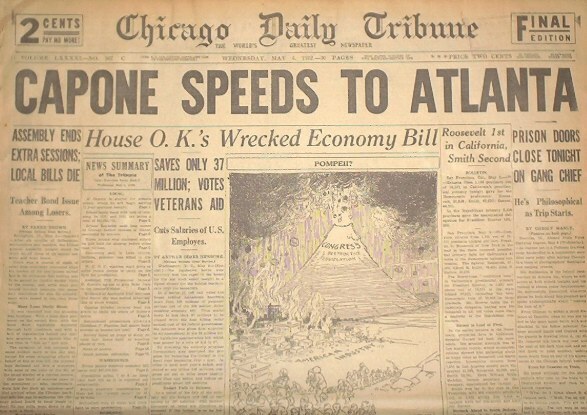 July 9,1925. (Mario Gomes collection). 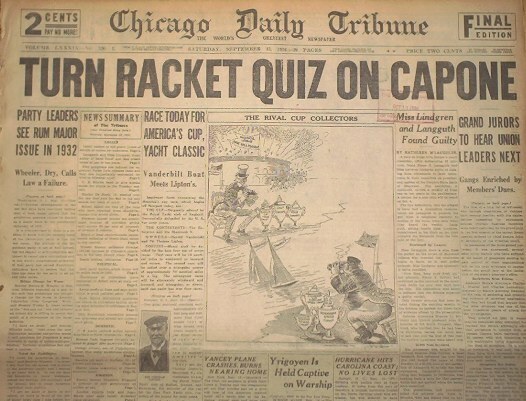 Investigation on Capone rackets September 13,1930. 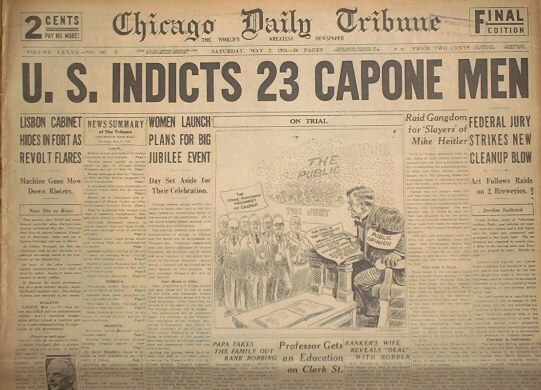 September 26,1930 police raid Capone gang and come across police document. 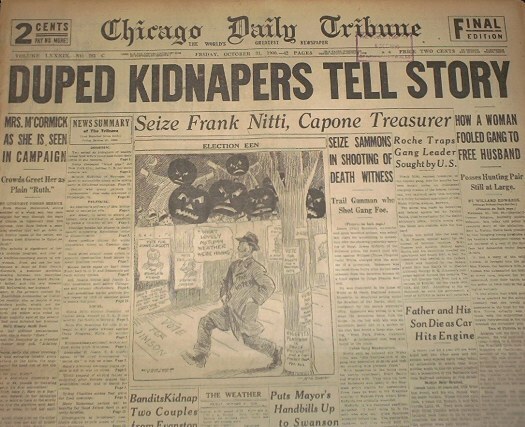 October 21,1930 Frank "The Enforcer" Nitti is arrested for income tax evasion. 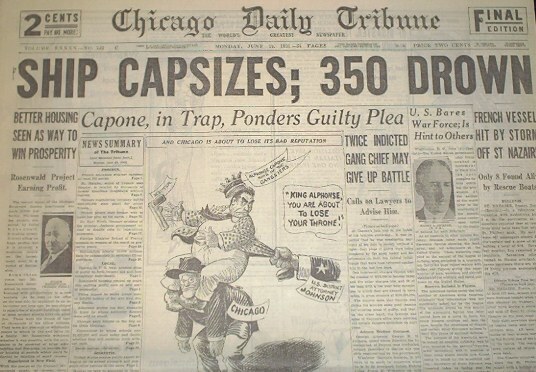 May 2,1931 U.S. indicts Capone men on various charges (income tax)also in this issue Mike "The Pike"Heitler's death investigation continues. 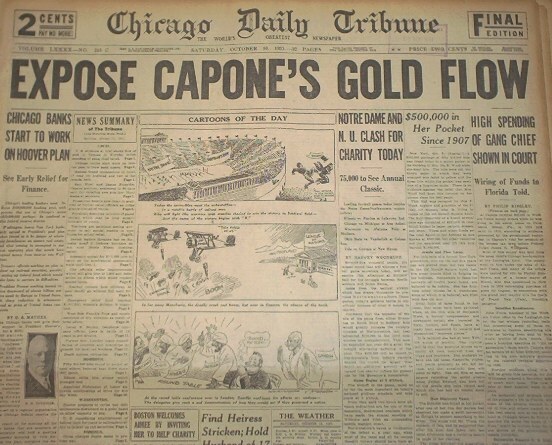 (His body was found torched in a car after being shot).He was exacting revenge by revealing Capone dealings to police.He was upset with Capone for being pushed out of the whoring business. 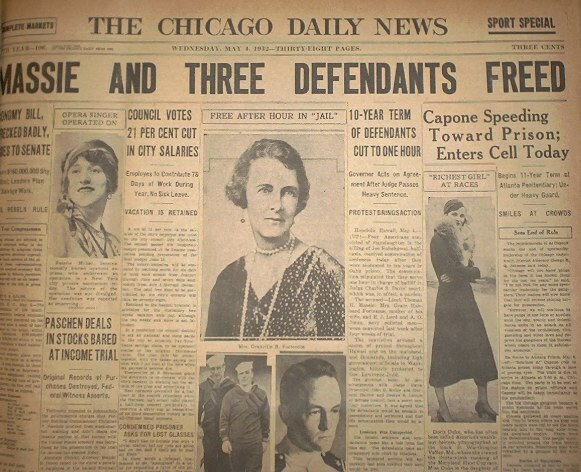 June 15, 1931. 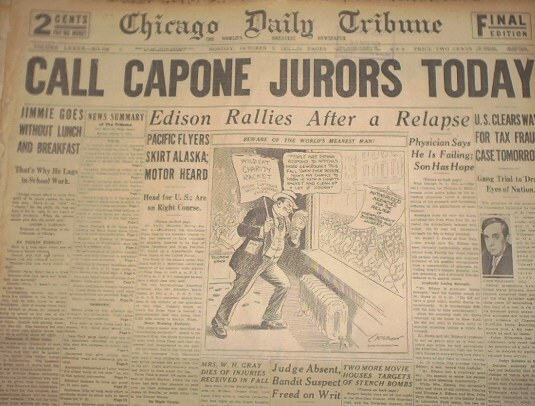 Capone decides on whether or not to plead guilty and receive less time mean whilethe rest of the Chicago mob contemplate who will take over Capone's post in the mobdom hierarchy . 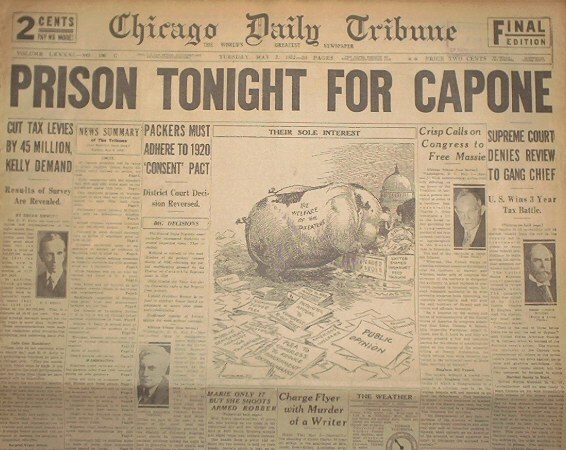 June 17,1931 Capone pleads guilty in attempt to cut a deal. It's rejected and he is warned by judge Wilkerson that no can bargain in a federal court. Capone then removes his plea of guilty.The court battle is on. 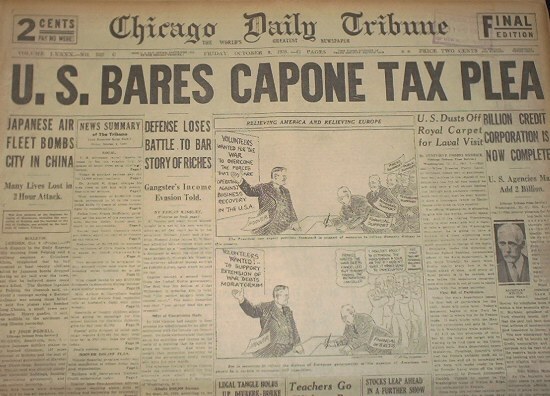 Al Capone's tax case will soon begin. 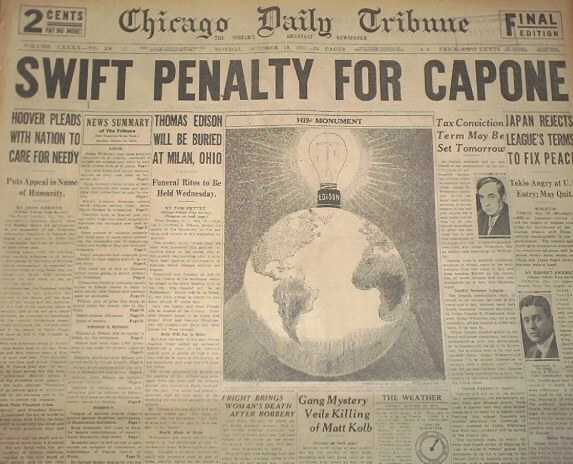 Oct 5,1931.Jury is selected. 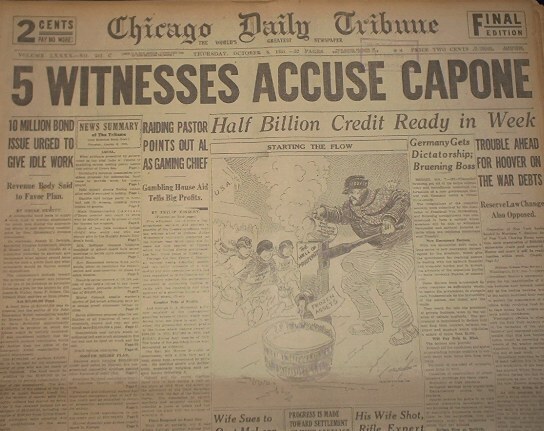 October 8,1931 five witnesses appear showing Capone had some sort of income. 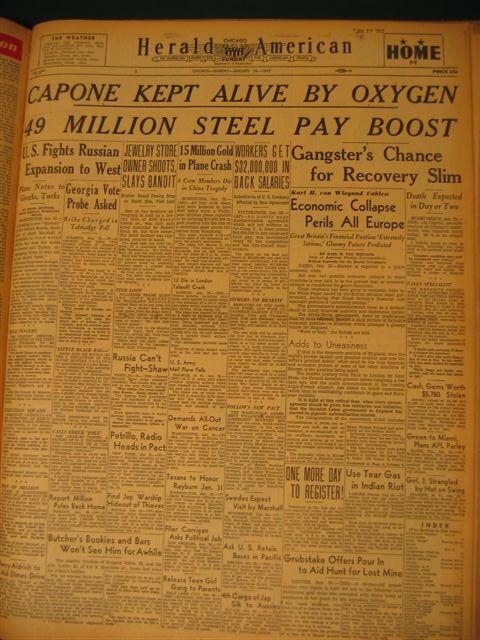 October 9,1931 The U.S. Government presents evidence of Capone's high living and expenditures. 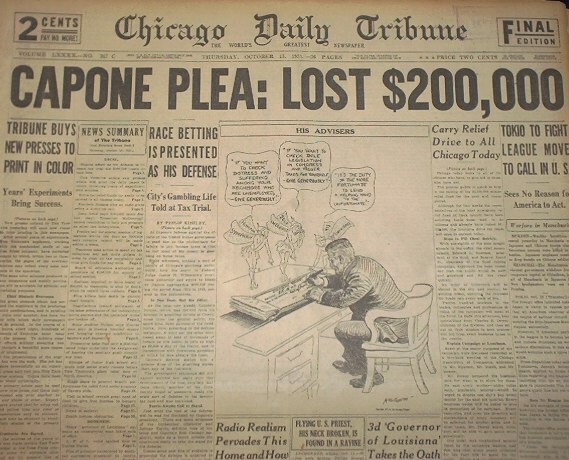 October 10,1931 Capone's heavy spending is revealed by shopkeepers and bookmakers. 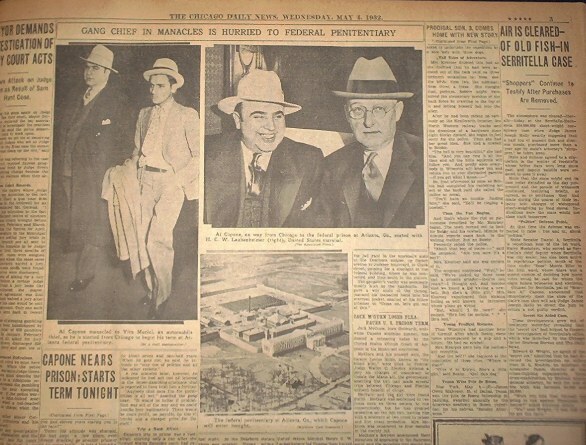 October 19,1931 sentencing is near for Capone's conviction.Capone retreats to the Lexington Hotel awaiting word from the courts. 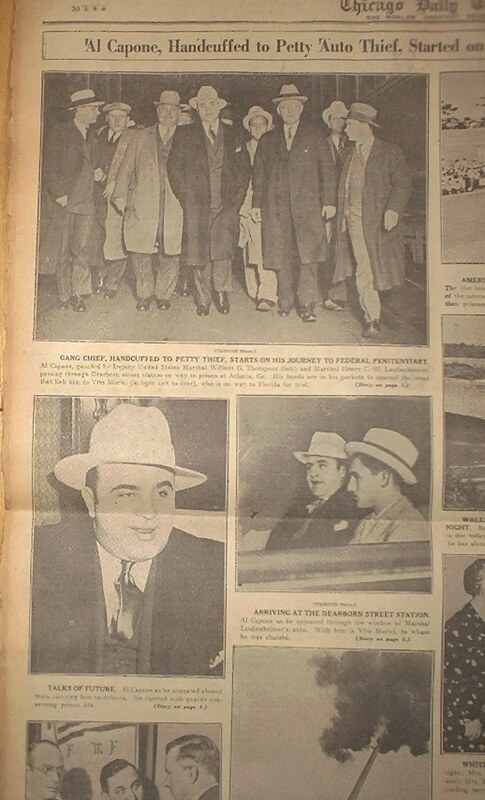 March 24,1932 Capone staves off going to Atlanta for a month. 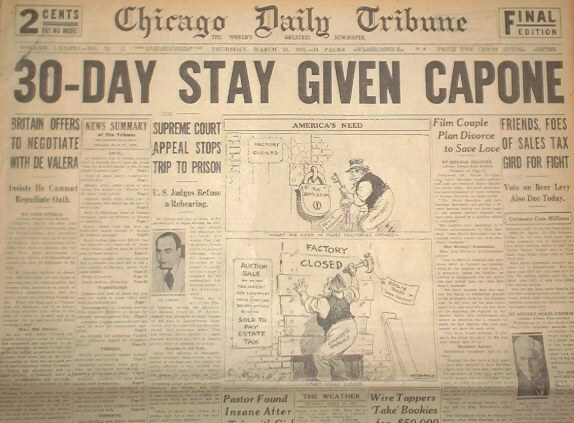 Chicago Daily News May 2,1932 Capone's lawyers try to stall their clients departure to the Atlanta penitentiary. It will fail. 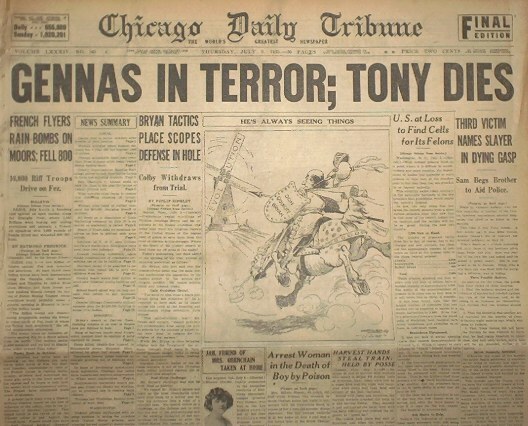 The Chicago Daily News May 3,1932. 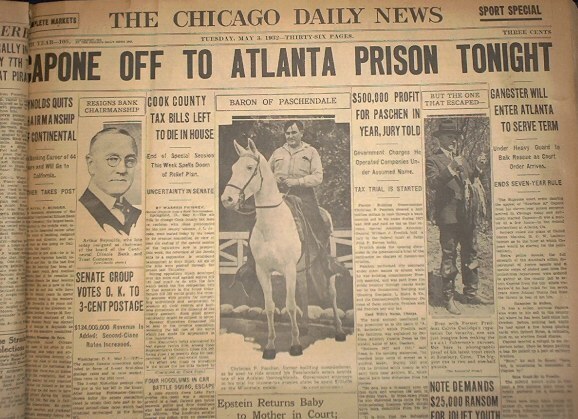 Capone off to Atlanta to begin his prison term. 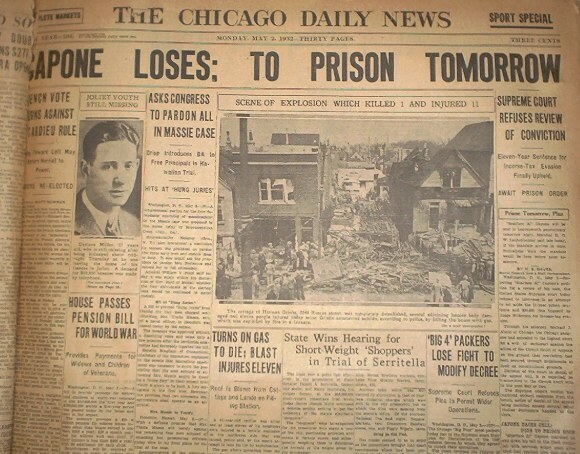 Chicago Tribune edition of same day. 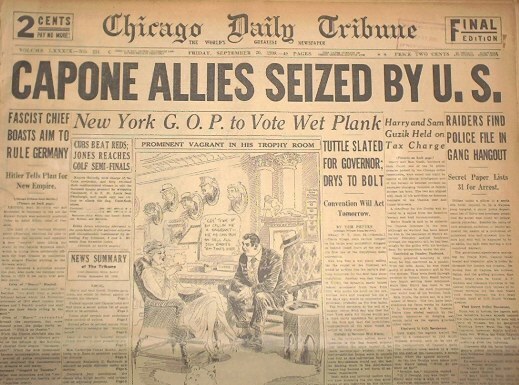 Chicago Daily News May 4,1932. Capone is enroute to prison.Many crowds of curious onlookers gather to peek at train containing Capone. Page three of same issue. 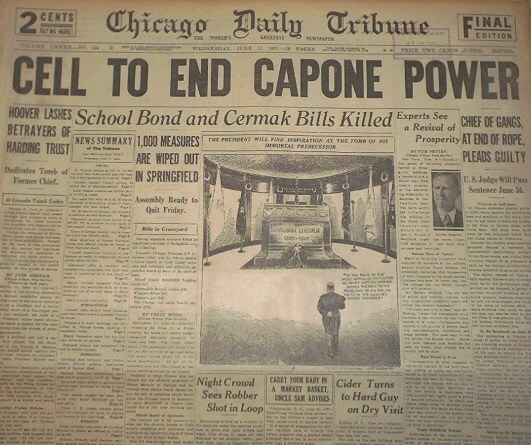 The Chicago Tribune edition of the same day (May 4,1932). 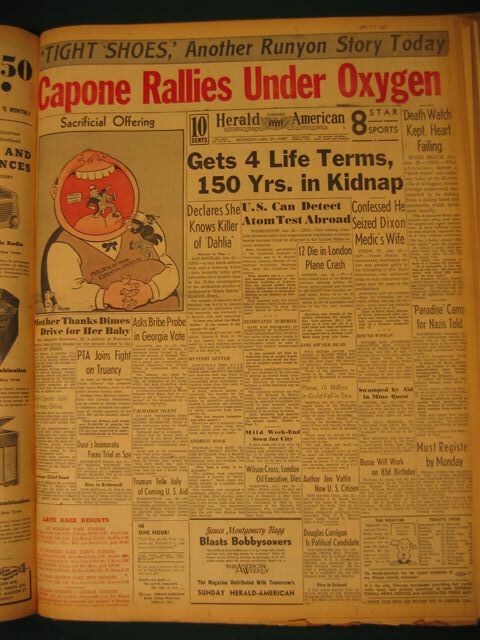 Capone was already dead when this came out. People who had shunned Al during his tax trial, suddenly started coming out of the wood work to remember their acquaintances with the big fella. 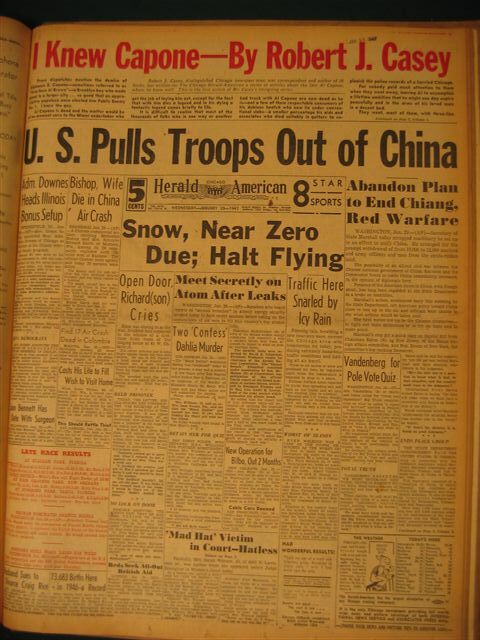 January 29,1947.